A few years ago, I made myself buy a bigger purse. For years I resisted carrying a purse at all, and then when I did start, I kept them as small as possible. Keys, wallet, and sunglasses were all that fit, because that was about all I needed. Eventually, I wanted to carry a notebook for scribbling in during otherwise wasted time. I didn’t want to carry two bags, so I bought a lovely hand-woven Peruvian purse from ClothRoads as a birthday gift to myself. A friend who had one assured me that the material wears “like iron” and looking at the bag today, I have to agree. I’ve used it for two years and it looks new. My big purse, hand-woven in Peru. I’ve gotten used to carrying a bigger bag, and I think that caused my next problem — not being able to find anything. A big bag means plenty of room for extras, and I’m in the habit of carrying all sorts of stuff I didn’t use to bother with. In the last month, I’ve had multiple moments of frustration where I nearly dumped my purse out in order to find what I was looking for. I started thinking it was time to buy a new purse, but because this one is still in such good condition, that seemed like an unnecessary and wasteful solution. Fortunately, I thought of Organizing from the Inside Out by Julie Morgenstern. I checked the section of the book where she tackles different sorts of things that need organizing, and sure enough, there was a chapter for briefcases and purses. A quick skim of it told me what my problem was: items did not have a home. There’s a small zipper pocket inside that I put my cell phone in, but otherwise the purse is a single large compartment. There was no way to sort or organize my belongings inside the bag. Since I didn’t want to go shopping for a new bag, I decided to make smaller bags to collect like things. The rule I made for myself was that after reaching into my purse, I should only have to open one thing to get at what I wanted. This meant that my prescription sunglasses, which travel in a hardshell case, could just go in the bag as-is. But most everything else could be inside a second bag. 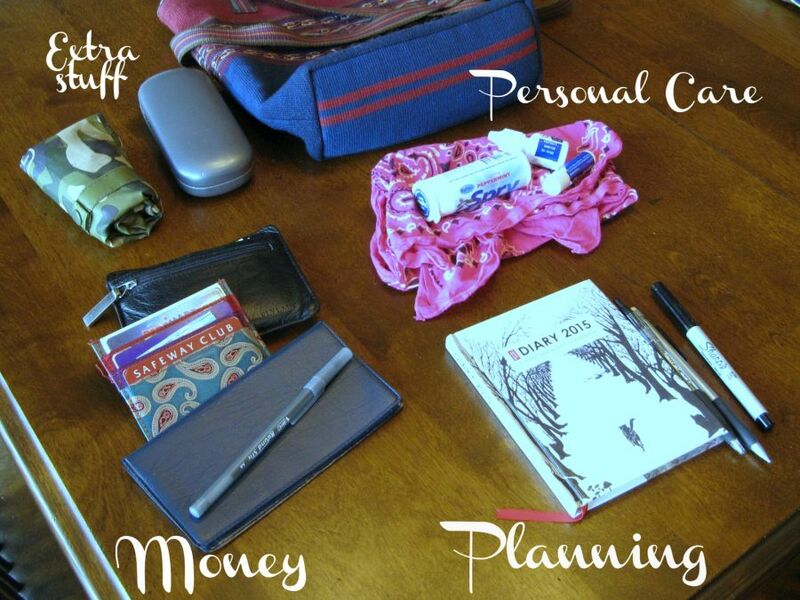 Following Morgenstern’s advice, I sorted the things I carry in my purse into like items. I wound up with three piles: money-related (wallet, discount membership cards, checkbook, pen), personal care (chapstick, eyedrops, gum, etc. ), and planning (calendar, pen, shopping lists). Next, I needed bags. 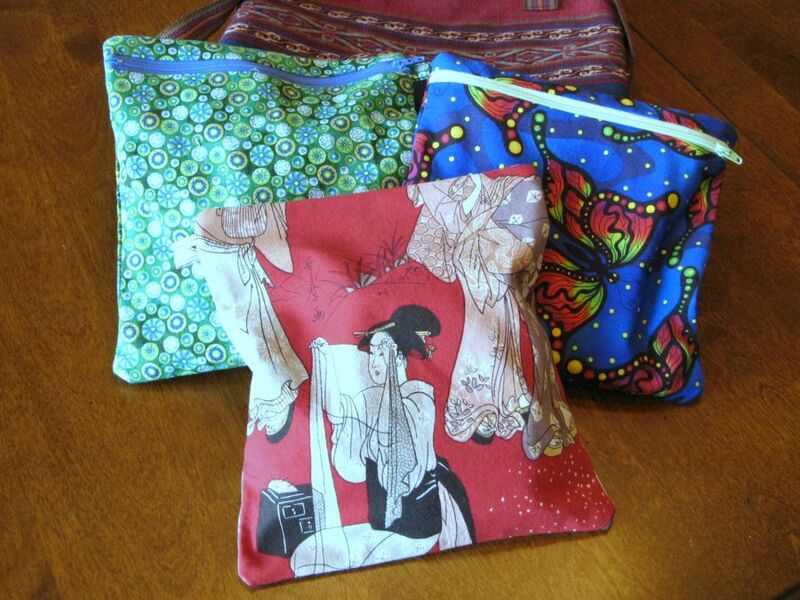 Since I used to make the little purses I carried, I was willing to make the bags that would go into my purse. 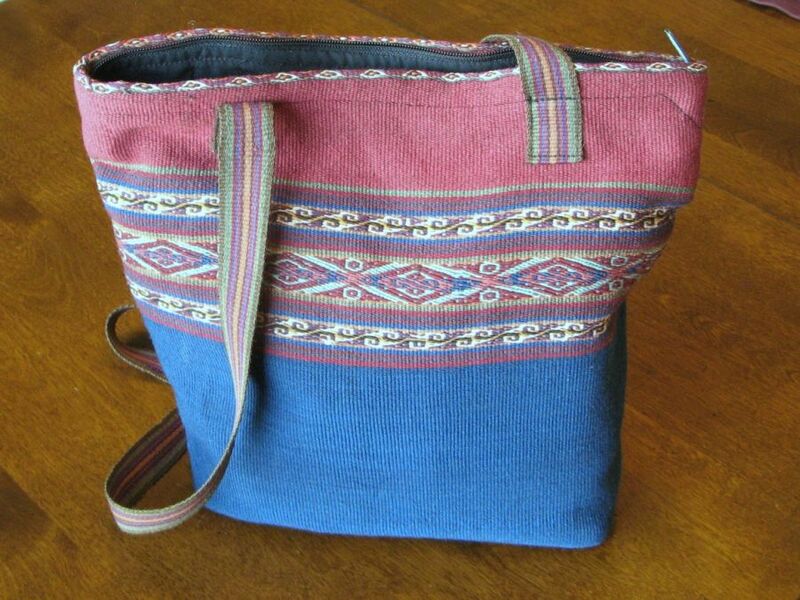 My favorite purse pattern is the Runaround Bag by Lazy Girl Designs. Although it includes a zipper, the construction of the bag is designed to make inserting it a breeze. So I used the trick from the pattern to put zippers in my much simpler bags for my purse. The bags I made to organize my purse. I chose the fabric to suggest the contents, hoping it will help me remember my new system. Money is green (of course), personal care has geishas primping on it, and the butterflies on the planning bag are symbolic of time passing. I’ve used the new bags for only a few days, but already, life is much, much better. Every time I’ve had to go into my purse, I’ve found what I was looking for without effort, and I no longer have to apologize to the cashier for having to wait while I dig for my wallet. It’s taken the frustration out of carrying my big purse, and I can love it again. Do you prefer big or small bags? How do you keep things you carry around with you organized?